* This is my guest post today in the EFN Asia website. 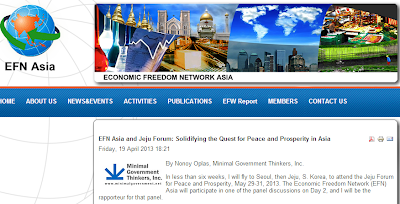 In less than six weeks, I will fly to Seoul, then Jeju, S. Korea, to attend the Jeju Forum for Peace and Prosperity, May 29-31, 2013. The Economic Freedom Network (EFN) Asia will participate in one of the panel discussions on Day 2, and I will be the rapporteur for that panel. There will be plenty of panel discussions on those 2 1/2 days forum. To accommodate them all, there will be about five simultaneous discussions on each time block. See the list of topics here. Day 1, May 29, I plan to attend session 1-D, "Cultural Exchange and Tourism Promotion in Asia Pacific Region". To achieve more peace and prosperity in the region and the world in general, mobility of goods and services/people should be made as free as possible. People will think less of war and conflict provocation if they see the beauty of other places and countries, if they understand the cultural practices in other places and hence, realize the need for more tolerance, to respect diversity among people. Human rights are respected in the process as people learn to be more tolerant of other people's cultural belief and practices, their social and economic aspirations. Then on the next panel, I plan to listen to session 2-A, Making Ideas Work: Challenges and Opportunities for Think Tanks in Asia. Many of the co-sponsors and partners of the Jeju Forum are think tanks, government and private. For me, the main purpose of think tanks, Minimal Government Thinkers included, is to explore new ways, more efficient and less costly ways, to attain a particular vision for the country, for the region, and the world. And that vision is a society where people have freedom and a peaceful environment so they can pursue more social and economic prosperity, both for the present and future generations. Many private think tanks though are constrained by funding. That is why among the biggest think tanks in Asia and the world are government-owned ones, their funding are assured yearly from taxes. One problem here though is that their research agenda and content is subject to explicit or implicit pressure from the politicians and officials of the national government. On Day 2 morning, I hope to attend session 3-C, Asia-Pacific Development and the Future of Korean ODA. I do not believe in the overall effectivity of Official Development Assistance (ODA) as it is a government to government (G2G) transfer of money and resources. If one or both is/are corrupt, then its effectivity in uplifting the lives of poor people in the less-developed country is immediately compromised if not negated. So the main beneficiaries of this G2G transfer are the politicians and officials, employees of the recipient governments. I think the best people to people (P2P) transfer of resources is via free trade (goods and services), more foreign investments and tourism. Nonetheless, I have to hear what the speakers have to say on the subject. There could be new things and development in this area. Disclosure: I was a former Korea International Cooperation Agency (KOICA) scholar, a two-weeks seminar on "Technology and Policy" in 1996 when I was still working at CPBO, House of Representatives. I enjoyed that seminar, I learned many things, aside from the many trips, hotel transfers, nice food, mountain resort tour, and warm, friendly Korean hosts and tour guides. Or I might skip this session and attend the session on 3-A, Coping with North Korean Nuclear Quagmire - What Options are Available? I like a quip from a friend in Korea who said, "A dog that barks loud does not bite". Exactly my sentiment, that the war mongering pronouncements by the North Korean leader Kim Jung-Un was more addressed to his countrymen, sort of saying, "My people, we will take on the mighty US and S. Korea militarily, so prepare for more hardships in life." The military confrontation is highly uncertain but economic hardships of the ordinary North Koreans will be a certainty. A "World Leader's Session" will follow these sessions, before lunch. I think this is where past Prime Ministers or Presidents of some Asian countries will speak in a big plenary hall. After lunch, I want to hear session 4-A, East Asian Regional Integration with ASEAN as the Driving Force. I think this is a good formulation. East Asia is actually dominated economically by the "big 3" -- China, Japan and S. Korea. But problem is that there are several lingering conflict among them. Like the on-going territorial dispute over small islands between China and Japan, which affects trade and investments on both countries. And the China "big brother" assistance to North Korea, which irritates the people in South Korea. I do not know if previous Japanese colonization of S. Korea is still a bitter memory for ordinary Koreans until now or not. 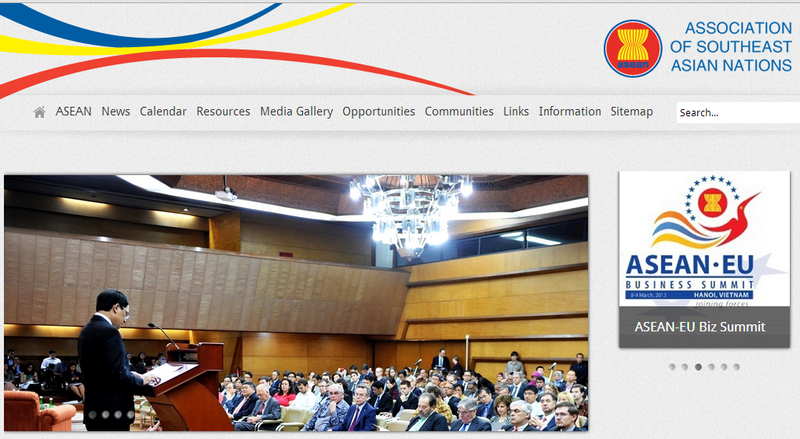 ASEAN member countries though, have few conflicting issues and have more issues and interests in common. In particular, the ASEAN Free Trade Area (AFTA) that will fully materialize just two years from now, in 2015. ASEAN is about 650 million consumers: About 250 M Indonesians + nearly 100 M Filipinos + nearly 90 M Vietnamese + 68 M Thais + 62 M Myanmars + 30 M Malaysians , these six countries alone have a combined population of almost 600 M people already. I heard one Malaysian diplomat who defined AFTA as "Agree First, Talk After". Then, OUR session, the EFN Asia time, from 3:40 - 5:00 pm, session 5-A, Economic Prosperity in Asia: Dealing with Economic Nationalism. The line up of speakers may not have been finalized yet, but a friend from Kuala Lumpur, the President of Institute for Democracy and Economic Affairs (IDEAS), a free market think tank in Malaysia, Wan Saiful Wan Jan, will be the moderator and I will be the rapporteur. Wait, is there no inconsistency between session 4-A and 5-A? The former focuses on economic integration while the latter talks about economic nationalism and protectionism? Well, both are realities and happening at the same time. For instance, the Philippine economy will have free trade with its neighbors in the ASEAN but will retain its generally protectionist policy to other countries. In a period of global economic uncertainties and financial turmoil, the tendency of many governments is to become more protectionist, restrict imports to "protect local jobs". But what if local jobs and businesses will be more productive if they use cheaper raw materials, machines and capital goods from abroad? And by turning to protectionism, an economy loses the goodwill of other countries that have been its trade partner for many years? These are among the questions and issues that our panel speakers will tackle, directly or indirectly. In the next round of sessions, I will most likely attend session 6-A, Unraveling the Dynamism of the Asian Economy: Patterns of Cooperation and Conflict in Trade, Finance, and FDI. This will be an appropriate follow up to sessions 4-A and 5-A. Identifying sources of cooperation and conflict -- in trade, finance and foreign direct investments. I would like to believe that in either cases of conflict or cooperation among Asian neighboring economies, the prospect of competition among themselves to attract more foreign trade, more foreign capital and investments, should be in the minds of Asian government officials. This way, they cannot be too rigid and inflexible in their policies to please local players and even local oligarchs. Lots of exciting panels to attend and listen to. I am getting more excited to attend the Jeju Forum.